Alas, I was mistaken. Just as he thinks he stopped growing at 15 when he left for Germany, the image I had of Kim was from all those years ago. In Korea earlier this month for a number of engagements, including two Beethoven piano sonata recitals at the Kumho Art Hall, Kim says he finally feels youthful, not young. “I think I am at that age when one needs to have a sense of responsibility,” he said at a bustling cafe in Seoul over a quick lunch on Dec. 6. He showed no signs of jetlag although he had only arrived the previous evening. The Berlin-based pianist is on a plane about four times a month, traveling to major cities around the world for concerts and recitals. “I don’t enjoy it,” he said. As we waited for the food to arrive, Kim talked about his life in Berlin. There are three great restaurants near his home -- Turkish, Vietnamese and Italian -- where he takes turns eating. When the food arrived, the din of the after-lunch crowd was too much and we decided to continue the interview the following week. 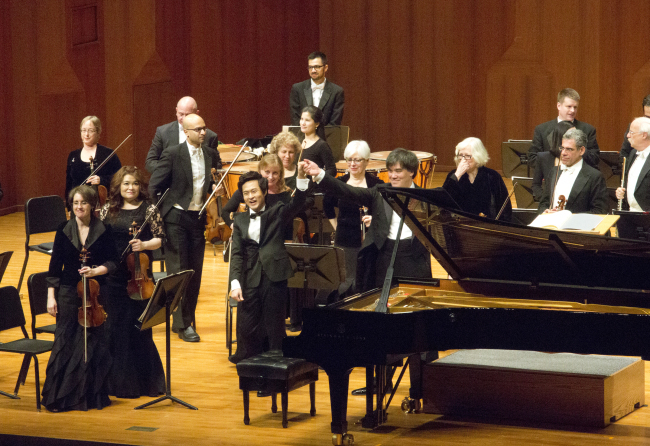 When we met again, he was at the Kumho Art Hall practicing for the next day’s performance -- the second in the Beethoven piano sonata cycle recitals spread over a four-year period. Kim is slated to give two recitals a year to cover the 32 Beethoven piano sonatas. Several well-known Koreans have performed the complete Beethoven piano sonatas, most recently the Paris-based 71-year-old Paik Kun-woo, who completed the series in eight consecutive days at the Seoul Arts Center earlier this year. “Beethoven experienced great difficulties in his life. But if you look at his manuscripts, you can see great efforts. He continued to correct. His pieces are a result of great efforts,” Kim said. Is there a possibility that his thoughts about the Beethoven piano sonatas might change in the course of completing the cycle? “I don’t think there will be change. Perhaps there might be more details,” Kim replied, adding that he might want to do the complete cycle every 10 years. One might say Kim had a rather late start -- he was 11 when he started playing the piano. But the child prodigy more than caught up, winning an international competition at 15. 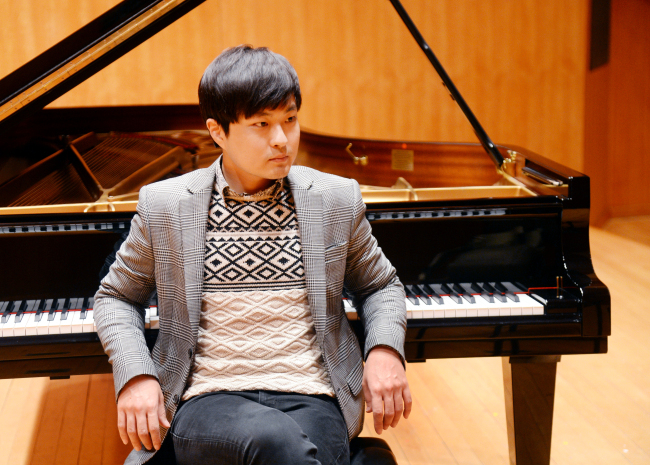 In 2006, he won the Nagoya International Music Competition and came in second place at the Isang Yun Competition. In 2011, he won the Epinal International Piano Competition. In 2013, Kim was named the Kumho Art Hall artist-in-residence, a new position that was launched with Kim in mind, and debuted with the New York Philharmonic led by Alan Gilbert the following year. His debut CD, “Dasol Kim Plays Schumann,” was released by Deutsche Grammophon in 2015. Next year, Kim is slated to perform chamber music at the Leipzig Gewandhaus in Germany, tour the US starting in March and perform at the Kuhmo Chamber Music Festival in Finland in July before returning to Seoul in October for the third and fourth Beethoven piano sonata recitals. “When I was young, I liked the feeling of running toward a deadline. But things changed in my 20s. Now, my foremost thought is to perform well. The goal is not to finish but to be more relaxed, to be inspired, to enjoy the silence,” he said. Kim does not think he could have been anything else but a pianist. “Probably not studying!” he said. He paused briefly before blurting out “Makeup artist, hair artist?” Indeed, in the two interviews, Kim turned up stylishly hip with his hair ever so slightly tousled for that nonchalant, I-didn’t-do-anything look. At a time when many young artists have taken to social media, directly communicating with their fans, Kim is an aberration. “I would rather focus on music. It means giving up on the public’s attention but I would rather give that energy in making music,” he said.